It is the same argument which is usually evoked while talking about educational outcomes. The genetic buildup of student and style of teaching/facilities both matter for the educational outcome. But what makes sports at Olympics different than educational outcome is that in the first case it is only the “crème de la crème” i.e. only the very best which matter. So, the average genetic makeup although important is not the only reason for bad performance. A lot of Indians fall for the first argument, while it is the latter which matters equally. If genetics were the only reason for performance, then countries would not go up or down on the medal tally. Comparing Russia against China makes this point abundantly. Some quick points to notice here. Russians are slipping down the medal tally while Chinese have been on an upswing since their second debut in 1984. The number of Russian athletes participating at the Olympics has not gone down but they are winning fewer medals as well as gold medals. If this trend continues we would see further fall in Russian medal haul, which points towards deteriorating sporting facilities in Russia. This can become worse over time as Russia will lose key strategists and coaches over time if it does not perform well thereby losing historical advantage over time. China on the other hand is supposedly a poor country, with poor genetics but it is getting stronger year after year. Anyone who has gone to China can confirm the small size of an average Chinese. Even malnourished Indians look like giants in front of an average Chinese person. If it were just about genetics then China would have never made it to the top of the medal tally. So, what is working in favour of China? This brings us to the second important point which is population size. The above graph gives population per medal and so darker green areas mean that more medals are won per capita. What is interesting to note here is that both India and China are white i.e. they both win few medals per capita although China wins a lot of medals while India wins almost none. China produces one Olympic medal for every 15 million people, while India takes 206 million. You can check more similar maps here. So technically speaking big population gives a big advantage not just to China but other decent performing countries with high population like in South America. So the genetic argument looks a little bit weak when you can choose from 15 million people like in case of China! 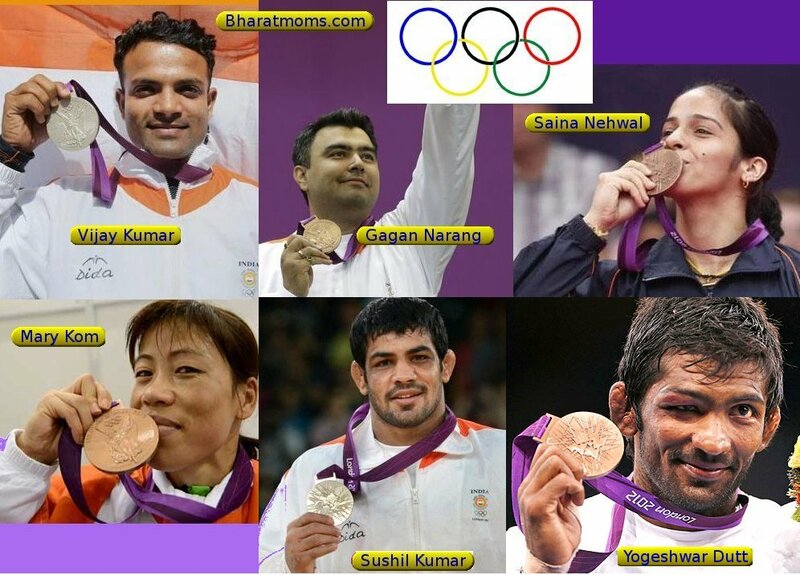 Sushil Kumar: Sushil Kumar was born in a Hindu Jat family of Baprola village, near Najafgarh in South West Delhi. His father, Diwan Singh, was a DTC bus driver, while his mother, Kamla Devi, is a housewife. Vijender Singh: His father, Mahipal Singh Beniwal, is a bus driver with the Haryana Roadways, while his mother is a homemaker. His father drove extra buses for overtime pay so as to pay for Vijender and his elder brother Manoj’s education. Mary Kom: Kom was born in Kangathei, in Churachandpur district of Manipur in eastern India. Her parents, Mangte Tonpa Kom and Mangte Akham Kom, worked in jhum fields. These are just few examples to show the background of most of our athletes. Except the shooters like Abhinav Bindra and Gagan Narang, most come from very humble background. Sports is make or break for many of them and many give it up for lack of support from the government and sports agencies. Also, most of them start their career late and usually give up as soon as they land up some decent job. Olympics is not just about talent any more and need intensive training and proper nutrition. And given social apathy, it is surprising that Indian can churn out a few sportsmen. So unless GoI decides to focus on sports to increase medal tally in the future or rich Indians take up sports in big numbers, India will continue to see itself at the bottom of medal tally. In the mean time, India should thank its bus driver and farmer parents for showing immense courage to help support sporting dreams of their kids. How long will we lag behind?